Article courtesy of the Tallahassee Democrat, written by Amanda Sieradzki. As another successful Design Week Tallahassee draws to a close, organizer and graphic designer Brittany Gress (BA 2017) reflects on her goals for next year’s event. Founded by designer Stephanie Irigoyen, Gress first attended Design Week by chance three years ago and was delighted to stumble upon a community of like-minded people. 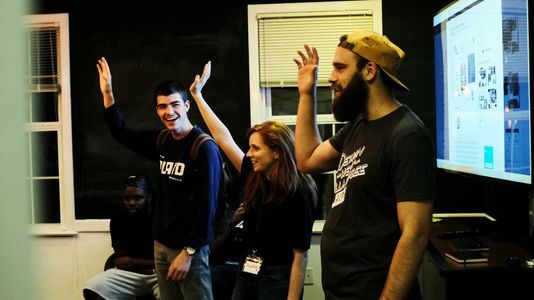 She felt energized by Irigoyen’s spirit, and took on organizing responsibilities for this year’s event, which included five workshops, five socials and four talks given by local and national designers. For coming Design Weeks, she is hopeful that more local designers will become inspired to step up into leadership positions. As a member of the local American Institute of Graphic Arts chapter (AIGA), Gress also wants to remind designers of the year-round events they can take part in, such as monthly Designer Drinks meetings and Coffee & Creatives meetings every second Wednesday of the month. This year’s theme, “Imagine” spoke to Gress’ vision of having designers become invested in the city and what they can achieve together. Gress says this is sometimes a challenge, as designers tend to be more introverted, but that establishing a support system where they are celebrated and showcased is imperative in order for their community to grow. Gress feels design stands apart from other fine arts as a more straightforward medium of communication. 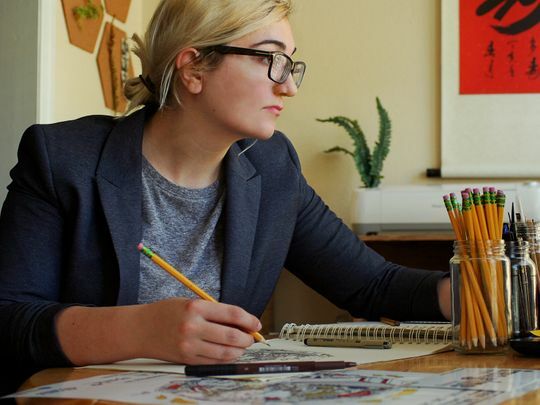 Starting out as a creative writing major, Gress ultimately graduated from Florida State University with a degree in design. As a former visual effects director for movies, Gress’ father was excited for his daughter to be a part of the same creative industry so they could share ideas with one another. Gress says she is also grateful to Julietta Cheung, who was her professor of typography, text and media, for giving her the tools to investigate her design ideas to their fullest extent. Currently, Gress takes on project-based work, which is reflected in her somewhat eclectic style. She’s drawn to stark, contrasting colors and will work in blacks, whites, reds and sometimes golds, though she’s continually challenging herself to branch out. Her design process differs greatly depending on the assignment. As a designer for the Florida Geographic Alliance, she recently completed a campaign that blends geography and the environment by teaching students to be good stewards of nature. Gress embraced the opportunity to design logos and materials for room-sized Florida maps that were then sent to classrooms across the state. 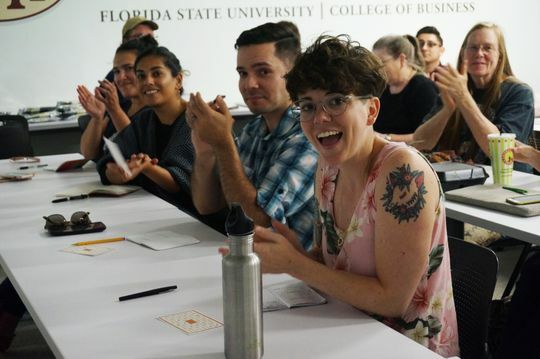 Gress also designs for Florida State University and remarks on how no matter the task, she always tries to find an aspect to love about a project. For Gress’ passion projects inspiration can strike any time, anywhere. Recently, she was inspired by a unique story of the unusual animosity between owls and crows and chose to illustrate their interactions in a book. Music is another integral part of her process, often colliding and combining with her design work. Design Week included five workshops, five socials and four talks given by local and national designers. Gress’ playlist varies from rap to electronic dance music to rock, however for a show in Minnesota, she designed classical music boxes with album cover designs. She was interested in exploring a physical object as a vessel for what is typically an ephemeral listening experience. Problem solving is at the root of Gress’ many investigations and is also how she describes the art behind design. Gress contemplates how the field can provide function as well as address emotional and societal problems while ultimately communicating a specific message. Regardless of her goal, she aims at connecting with viewers through her passionately articulated work. Gearing up for her next project and next year’s Design Week, she hopes to continue linking up with local design talent in order to grow the programming and strengthen its impact.